I’m writing this almost a week late. Last Friday, we flew to Moontown and Aaron got out and let me solo again. I attempted 6 landings but ended up doing a go around on two of them. The runway there is a bit shorter and one end goes over a road so you have to come in a little steep but still land it soon. This week the weather has been too cloudy to fly VFR, so I haven’t done any flying. Yesterday, we talked about flying in class C airspace in preparation for our flights to Huntsville International Airport. I am required to land there three times solo for my license. Aaron also endorsed my logbook to land at Fayetteville airport in Tennessee, so I have cooked up a plan to fly from Madison County south to the Tennessee River, around Monte Sano and land at Moontown. Then I will fly to Tennessee and land at Fayetteville and then back to Madison County… but I need to wait for good flying weather which doesn’t seem to be coming any time soon. Yesterday I practiced more crosswind landings, but first we had to fly over to Moontown to make way for someone who seemed to want the whole airport to themselves. The trees blocked most of the crosswind so the landings were pretty easy, but there was a bit of turbulence on takeoff at about tree level from the wind blowing past the trees. Then we flew back to Madison County Airport and did more landings there. There was nothing to block the wind so the crosswind was pretty stiff. Most of the landings could definitely have been improved upon. Today the air was pretty calm and we did a few takeoffs and landings before he asked if I wanted to solo. I took him back to the FBO and he took a golf cart over to the start of the runway. The first takeoff was great and I got to pattern altitude quicker than usual, probably due to the missing weight. The landing also worked out great. The second landing I did I came in too fast and too high, so I went further down the runway than usual and I landed on my main wheels before stalling which took me by surprise so I didn’t compensate and turn it into a wheel landing. The airplane bounced a few feet back into the air and this time I held the airplane off the ground until it stalled and I did a three point landing (meaning all three wheels touched at about the same time) as I intended. The third landing turned out great as well–then he asked if I wanted to do another because he originally told me to do three. I did another, but this time on takeoff I felt like I was getting pushed to the left right before takeoff, so I banked into the wind and lifted the left wheel off the ground first before taking off. He got on the radio and said I probably should have been banking the other way because the prevailing winds were coming out of the left, so I’m not sure if it was my imagination or if I really did hit a phantom pocket of air pushing to the left… anyway… it didn’t really affect the takeoff. That landing turned out pretty good too. When we got back to the FBO, he cut out the back of my T-shirt and we wrote on it my solo date and airplane and posted it on the wall. Now, I can rent the plane whenever I want as long as the winds are fairly calm and I stay within 25 miles of the airport. First we flew to Moontown and practiced a few landings there. Traffic was better than it had ever been to this point with three airplanes in line to take off after we landed. We did a couple three-point landings and then practiced some wheel landings. After a few goes he had me fly back to Madison county airport for some crosswind landings. The wind was gusting to about 20 miles per hour perpendicular to the runway so by the time the airplane was touching the runway it was banked significantly into the wind with a lot of rudder compensation to get the airplane to track straight down the runway. I keep touching on one wheel and subconsciously leveling the wings at touchdown which always results in having to add power and try again or perform a go around. Takeoffs were also a little tricky as I had to turn the ailerons into the wind so when the tail lifted up and the airplane got close to takeoff speed it would rise up on one wheel, banked into the wind but still traveling straight down the runway before taking off. So… anyway… my three point landings are turning out great but still having trouble with the wheel landings. I think I would have done better at them without the wind, but that is what they are useful for. We also worked on being more comfortable with the throttle while performing these landings and not hesitating to add a little power to compensate for excess sink rate or to help recover from a bounce. Anyway… he said I might solo tomorrow if the weather is calmer. Today, we prepared more for what I need to know in order to solo by reviewing the sectional (map) together. I am allowed to fly within a 25 mile radius of the airport. I don’t know when my solo will be but he makes it sound like it could be really soon. We practiced more landings today, this time with a bit of wind so they were a little harder. I still never landed a wheel landing very well–they all turned into bounces followed by full-stall landings. He demonstrated a nice one where he landed on one wheel and went quite a ways down the runway like that until leveling out and lowering the tail. The trick is the airplane MUST be lined up straight down the runway when it touches or else all kinds of craziness will start to happen. If there is a crosswind you still have to be traveling straight down the runway but the only way for that to happen is if the airplane is banked into the wind with a bit of opposite rudder to keep it going straight. That makes it so you’re just about guaranteed to land on one wheel at a time. After a few failed attempts at wheel landings, he let me do some more full stall landings that all turned out pretty nice. We practiced another engine failure from the pattern and I saved us and landed on the runway. He gave me an engine failure shortly after takeoff and I got us lined up for a nice landing in some farmer’s field before he restored engine power and we flew around for another landing. I’m writing this a day after flight school day 8. I had planned on flying today but it was rainy and the clouds were a bit low for flying so I got my flight physical today instead… $125 to check if I’m colorblind, read letters on the wall, and to have a light shined in my eyes and stuff stuck up my ear :-) Anyone looking for a future profession might want to take that route. Anyway, when I asked Aaron when I needed to get it done he was extremely relieved that I remembered and said to get it done ASAP. When I called the place they asked if the 27th would be good and I said the earlier the better, so they said I could come by at 6:30PM in the afternoon–I don’t generally consider that to be the afternoon but I showed up anyway. Anyway, flying yesterday went great. We flew around the pattern at the same time an AN-2 (the largest single engine biplane) was flying. We had to be careful to fly a little higher than it and land and takeoff outside of its wake. I practiced about 13 landings. The landings were really starting to work out nicely so Aaron decided to have me try “wheel landings” where you land on the front two landing gear with the tail in the air before slowing down and lowering the tail into the ground. The method we were using before is known as the “full stall” method where you fly close to the ground and keep pulling up with the engine idled until you can no longer pull up anymore and the wings stall as the airplane touches the ground. The trick to the new method is once the front landing gear touch, the back end of the airplane keeps falling towards the ground increasing the angle of attack of the airplane (basically automatically pulling the nose back into the air) and makes the airplane want to take off again, so you have to push forward on the stick right after the wheels touch to plant them on the runway and then perform a balancing act on two wheels until the airplane is slow enough to gently put the tail down. My “wheel landings” all turned into bounces that got recovered as full stall landings. After we landed, we went and talked to the pilots of the AN-2 biplane and they let us get inside and see what its like. It was pretty impressive. There were way more knobs, dials, switches, and instruments in the cockpit than I imagined. 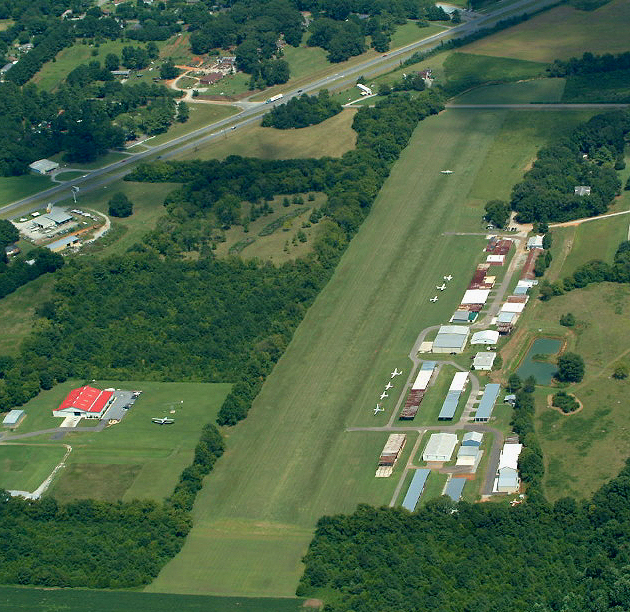 Both days I flew from Madison County Executive Airport to Moontown (the grass strip airport). Apparently a grass strip is more forgiving to land on and that is why we practice so many landings over there. He is pretty much completely letting me land the airplane. At first there were some crazy landings including one sideways bouncy landing on the left side of the runway that resulted in a go-around. I’m still learning how to slip. It’s a little hard for me to get myself to do opposite rudder and ailerons and get into the somewhat crazy attitude, but I feel like I’m getting better at it. It’s preferable if you’re turning to keep the airplane rolling in the direction of the turn and then apply opposite rudder. At first I would somehow end up rolling opposite of the turn and then guessing again until I figured it out… by then it would be about time to do a go around and try again. Now I feel more comfortable with it but tend not to quite fly the straight line while doing it that I intend. Takeoffs yesterday were pretty hairy with the airplane going all over the place. Then he told me to be a lot more aggressive with the rudder and more immediate with the aggressive pressure. That has seemed to work great so far and since then all my takeoffs have been very good. I am even taking off at the right airspeed without going too fast like I was before. Today he turned off the throttle and told me the engine died and I had to make it back to the runway. The first step is to get the airplane to 68mph which is the optimal glide speed. I was pretty gentle about pulling up to raise the nose and decrease airspeed because that is how I usually slow down to land, but I needed to pull up more immediately because any time not spent at 68mph is wasted distance. I turned the airplane towards the runway sooner than usual and needed a huge slip to drop enough altitude to get down, but we landed safely on the runway. Because he cut my engine while I was checking for icing in the carburetor by applying heat, I forgot to turn the carburetor heat off before takeoff and he had to remind me before I taxied onto the runway. Todays landings were much better and I only did one go around because I was too high. I also tend to pull back on the stick without noticing when I feel like we are short of the runway. This decreases the airspeed below the optimal airspeed and causes us to glide even less distance than we want. I need to keep the nose down and airspeed at around 70mph regardless and increase throttle when we are short. I performed almost all the landings myself and he seemed to think they were all pretty good. There were still a couple bounces today but much lower than before and I did a better job of keeping the airplane in line with the runway on landing. While we were flying around a huge biplane (apparently the largest single-engine biplane ever built) flew from Madison County Executive Airport to Moontown. It was definitely a slow-mover. All total I did 15 landings and takeoffs the last couple days. Aaron said I will probably be solo pretty soon. Today I flew in the pattern and practiced landings and takeoffs for about 45 minutes. One of the landings (my seconds to last) was near perfect. Aaron was really excited with it. The rest were a little bit of everything. My takeoffs got progressively better but I still have trouble heading straight down the runway. The problem is made worse because I leave the airplane on the runway a lot longer than I should. I know I’m forcing it down but I am hesitant to glance down at the airspeed indicator to verify I am at takeoff speed because I’m busy keeping the plane from driving off the runway. We practiced some more side-slipping to reduce altitude on approach and that seems to be working okay just trying to get the right amount of rudder and aileron to keep flying straight. Today we practiced some more stalls and added the power-on stall where we slowed down to about 60mph and then increased the throttle to full-throttle while pulling up. This was a bit easier to recover from without losing much altitude but you feel like you are going pretty steep before the plane actually stalls. Then we flew to a grass strip called Moontown. Caroline flew there in 7th grade. I attempted 4 landings of which two actually ended up with the plane on the ground and the others ended in go-arounds. Aaron also taught me how to side-slip to lose altitude because I kept coming in too high. I seem to have a psychological block preventing me from wanting to fly close to the ground :-) That’s probably been the most wild maneuver so far but it seems to work nicely for him. I am getting a lot more comfortable with the takeoffs–I didn’t realize how far you have to push the stick forward to get the tail off the ground before but now it seems to work nice. I am still fighting against drifting left on takeoff but it’s getting better. Also, my turns in the pattern are still a bit shallow and I end up flying a bit past the runway and having to come back in. We flew back to Madison County and I judged the distance better and chose the correct time to idle the engine and we made it at about the right altitude but I wasn’t completely level when we touched down and we bounced on one wheel before settling onto the runway. He seemed pleased with the landing though–he was probably just glad we survived. The attached image is from the Moontown webpage, I just thought you’d like to see what it looks like. Today was a pretty windy with a brisk wind from the south. He let me preflight the airplane myself before he came out and made sure I didn’t miss anything. Since it was windy we had to use the ailerons and elevator while on the ground to keep the plane flat on the ground. I taxied the airplane to the runway and took off with his help. We still took off a bit left of the centerline but not as much as yesterday. We practiced 45 degree turns some more and he said I did great. I tend to climb a bit when I end the turns because I pull back through the whole turn to maintain altitude and then don’t let off enough at the end. We practiced slow flight again today at 60mph (yes, thats 60mph, not knots). Yesterday we practiced slow flight at 70mph. We did some more power off stalls and they were a bit better today except for I still yaw about 15 degrees during the stall and recovery. Then we flew at about 1500 feet while turning around a point on the ground. The wind made this quite challenging–when you are downwind of the point you have to turn harder to keep from getting blown away and when you’re upwind you don’t turn very steep at all. I also got to talk on the radio a little bit before takeoff and before we entered the traffic pattern.